SVR Spirial Spray Deodorant is an anti-perspirant deodorant with 24 hours efficiency. Specially created to regulate normal to excessive underarm perspiration, this double action spray is also suitable for sensitive skin. 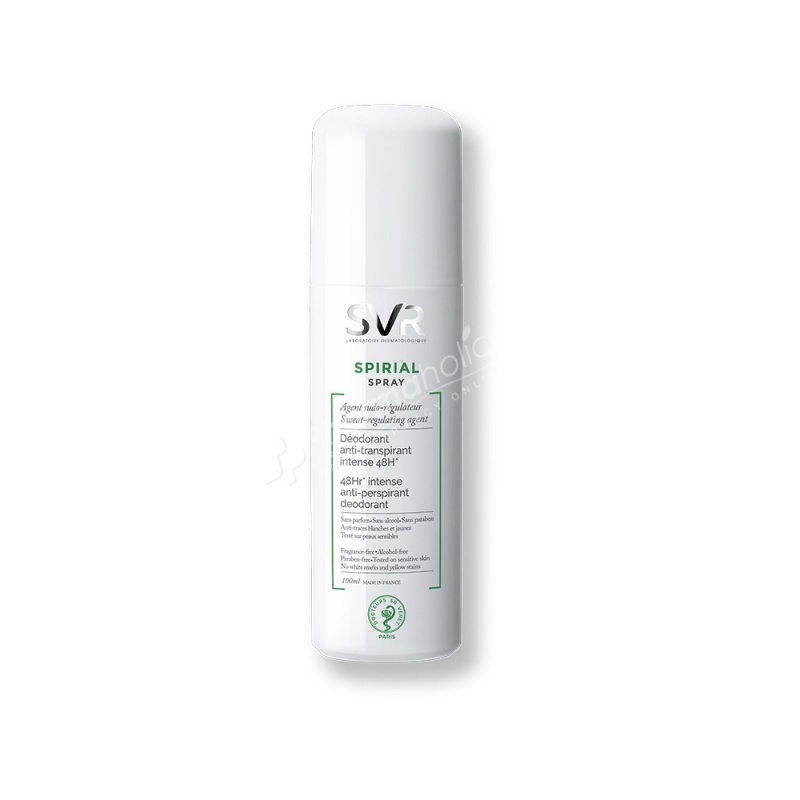 SVR Spirial Spray Deodorant is an anti-perspirant deodorant with 24 hours efficiency. Specially created to regulate normal to excessive underarm perspiration, this double action spray is also suitable for sensitive skin. Used daily, this treatment brings comfort and freshness for an immediate sensation of well-being. The presence of allantoin gives its soothing properties. Tested under dermatological control. Hypoallergenic. Alcohol-free. Fragrance-free. No white marks. No yellow strains. Spray each day on clean skin. Aqua, Aluminum Chlorohydrate, Cyclopentasiloxane, Glycerin, Methyl Methacrylate Crosspolymer, Triethyl Citrate, Cetearyl Alcohol, Microcrystalline Cellulose, Ceteareth-33, Allantoin, Arachidyl Alcohol, 1,2 Hexanediol, Caprylyl Glycol, Behenyl Alcohol, Arachidyl Glucoside, Cellulose Gum, Tropolone.